In 1879, S.H. Rumph bred the Elberta peach from a Chinese Cling peach in Marshallville, Georgia, giving birth to the Georgia peach industry. Today Georgia is known as "the peach state" and produces over 130 million pounds of peaches annually. Varieties are classified by how hard the pit of the peach "clings" to the fruit. Cling, cling-free and semi-cling peaches are all grown in Georgia, many on family orchards that span three or more generations. Flavorich peaches are grown throughout Georgia, and are one of the first varieties to ripen. These delicious clingstone peaches become available in mid-May. The fruit is medium-sized and dark red in color. The Flavorich peach has a good sugar to acid balance, which makes them a preferred choice for jams and preserves. The Rubyprince peach is grown in much of the state of Georgia. It is a semi-free peach that usually becomes available during the first week in June. 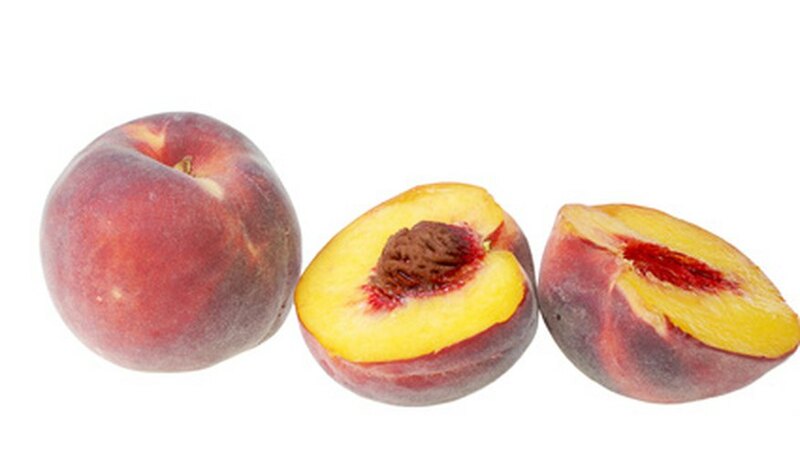 The Rubyprince is a dark red peach with yellow flesh, and are delicious when eaten fresh. Starlite peaches are grown in central and southern Georgia. They are a semi-free peach, so a good choice for fresh eating. These peaches ripen in the middle to latter part of May. The fruit of the Starlite is dark with a white flesh. Georgiabelle peaches are grown in the northern two-thirds of the state. This is a free-stone peach, which makes it ideal for freezing, canning and baking. The fruit has a yellow flesh with red-orange skin. They are normally harvested in late July to early August. Redskin peaches are grown in all locations in Georgia. They are normally available in late July each year. These are freestone peaches, which makes them an excellent choice for preserving or baking in cobblers. The fruit is red with a yellow skin. Juneprince peaches are grown in the southern half of Georgia. These are a semi-free peach, delicious for fresh eating or baking. Juneprince peaches are normally picked in June each year. The fruit has a yellow flesh. The Flordaking peach ripens in mid-May. It is grown primarily in the southern part of Georgia. This is a cling peach and a nice choice for making jams or pickling. The fruit is medium-sized, very firm and yellow. The Suwanee peach is grown in the southern half of Georgia. This peach ripens in late June or early July. It is a freestone peach with yellow flesh. These peaches will do well for almost any use including eating fresh, freezing and baking. The Jefferson peach is grown primarily in the northern part of Georgia. The Jefferson Peach will ripen in the early to middle of July. This peach is a freestone variety. It is a wise choice for canning, freezing or fresh baking. The fruit is medium red with a deep yellow flesh. Surecrop peaches are grown in northern and central Georgia. These peaches are a semi-free variety. They are harvested during the month of June. The fruit of these peaches is good for use in fresh-baked desserts or for snacking. They are a firm fruit with yellow inner flesh.